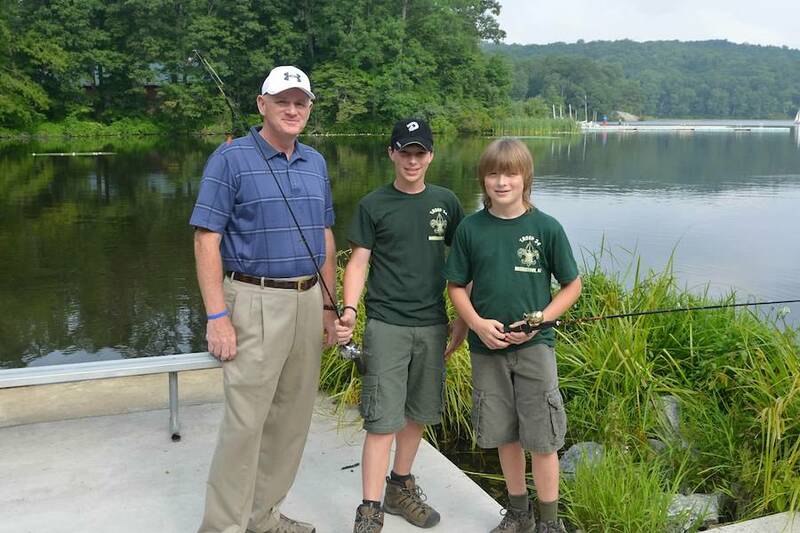 Chuck Roberts (left) with Boy Scouts fishing at summer camp. Photo courtesy of the Boy Scouts of America, Patriots' Path Council. 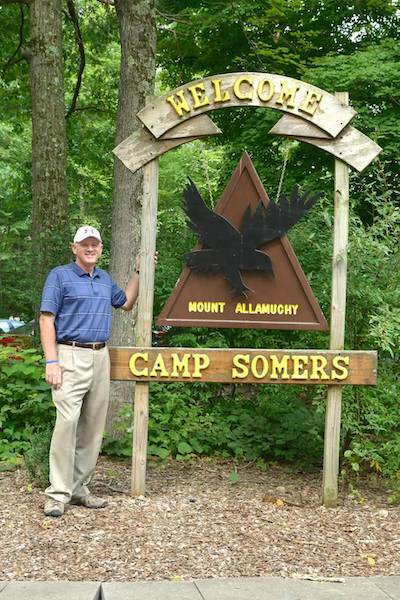 SUSSEX COUNTY, NJ – The Boy Scouts of America, Patriots’ Path Council will be honoring Charles A. Roberts of the Ames Rubber Corporation with the 33rd Annual Sussex County Distinguished Citizen Award on Wednesday, October 22, 2014 at Perona Farms in Andover, for serving as an exemplary role model for the youth of our area. Charles (Chuck) lives by the Scout Oath and Law and work to improve the opportunities and quality of life in Sussex County. 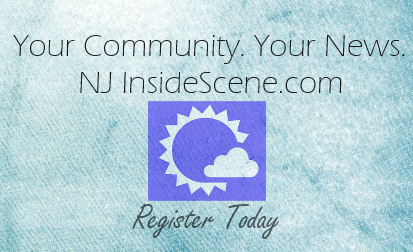 This year, the event co-chairmen are Tony Torre of Sussex Bank and Joe Toscano of CP Engineers & Architecture. Chuck Roberts at Mount Allamuchy Scout Reservation-Camp Somers located in Stanhope. Photo courtesy of the Boy Scouts of America. Patriots’ Path Council. Chuck joined Ames Rubber Corporation in 1976 and currently serves as President and Chief Executive Officer. He is very involved in the community and serves on the boards of Sussex County Community College Foundation (Chairman); Sussex County Economic Development Partnership (Past Chairman); Sunrise House Foundation Board (Past Chairman); and Sussex County Strategic Growth Planning Committee. He has also previously served on many boards including the Franklin Zoning Board and the Lake Mohawk Golf Club Board of Governors. Chuck was a Cub Scout and Boy Scout in the Franklin Scout organization in the 1960s. He was born in Sussex, NJ and now he and his wife Diane have two sons and reside in Franklin, NJ. Through the 33rd Annual Sussex County Distinguished Citizen Award Dinner, funds will be raised to support the mission of the Boy Scouts of America: “…to prepare young people to make ethical and moral choices over their lifetimes by instilling in them the values of the Scout Oath and Law.” For his outstanding example to youth in his community, the Boy Scouts of America salutes Charles A. Roberts with the 33rd Annual Sussex County Distinguished Citizen Award. 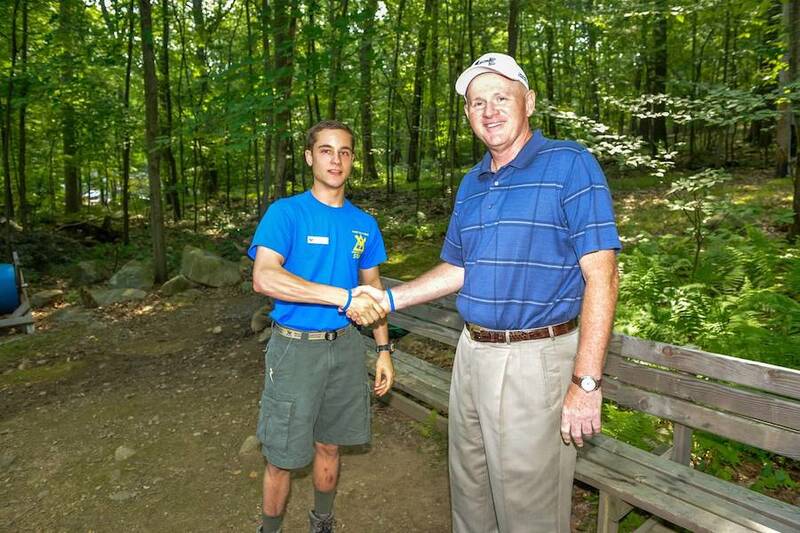 Chuck Roberts (right) with Eagle Scout Ryan Gallagher at summer camp. Photo courtesy of the Boy Scouts of America, Patriots’ Path Council. For more information about the awards dinner being held on Wednesday, October 22, 2014 and to purchase tickets, please contact Jennifer Volz, Development Director 973-765-9322 ext. 249 Jennifer.Volz@scouting.org.